Monty Brogan (Edward Norton) has 24 hours before he must surrender himself to Federal authorities and begin serving a 7-year sentence for dealing drugs. Monty spends his last 24-hours of freedom looking back over his past and forward to the 25th hour, the hour which will shape the rest of his life. "25th Hour," Spike Lee's first feature film since "Bamboozled" is a mature change of pace for the always interesting director. "25th Hour" harkens back to the early works of Martin Scoresese, especially "Mean Streets." Lee's film doesn't achieve the classic status of "Mean Streets," but it does have the taste, smell and feel of that earlier film. 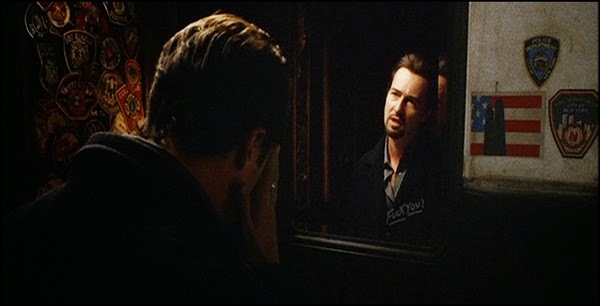 "25th Hour" also looks back to the films of the 70s with its wonderful ending. Monty can't enjoy his last day with his lover Naturelle (Rosario Dawson). Monty suspects she was the one who turned him into the Feds. The cops said she did, and so did his Russian supplier, Kostya (Tony Siragusa). The fact that Monty still lives with Naturelle tells you something about his character. He's basically a nice guy who makes his living off of other people's misery. In the opening sequence, Monty and Kostya are on their way to a drug deal. Monty stops his souped-up Dodge Charger in the middle of a bridge and saves a dog that has been thrown from a car. He names the dog Doyal after Kostya says that Monty brings him (Kostya) bad luck. "You're just like Doyal's Law: It will go wrong." So the dog that should have been named Murphy, ended up being called Doyal. That's the kind of guy Monty is. He is conflicted. He wants to believe he can trust Naturelle, but then again, she was the only one who knew where the drugs were kept. Monty's namesake is Montgomery Cliff. His father James (Brian Cox) wanted to name him James Jr.. Instead, Monty's mother won out. Like the troubled actor, Monty has made a lifetime of bad choices. Those choices are closing in on him. Frank (Barry Pepper) and Jakob (Philip Seymour Hoffman) are Monty's best friends. They want to show Monty one last night of fun, Frank is a high powered Wall St. trader who is willing to risk other people's money to insure he never goes back to the old neighborhood. Jakob is a dweebish teacher at a prep school who has the hots for Mary D'Annunzio (Anna Paquin), a pierced, tattooed hottie in his English Lit. class. The sub-plot between Jacob and Mary is Lee's one big misstep in this movie. Jakob's character plays an important role in the movie. It seems that the teacher/student sub-plot was thrown in to give Jakob something to do before he is really needed. "25th Hour" is episodic. The film doesn't follow the paradigms espoused by the numerous "how to" screenwriting books that crowd bookstore shelves. Lee follows the characters through this all-important day. Flashbacks are used when necessary to show Monty reflecting on what got him where he is. Lee's conservative use of the flashback rivals Sam Peckinpah's use of the same technique in "The Wild Bunch." They are short and to the point. Edward Norton proves once again, that he is the best young actor working in film. Monty is an introspective character. He is living the most pivotal day of his life. Norton expresses this angst through a number of acting methods. His performance is lean. No fat whatsoever. Norton's Monty realizes he has screwed up. Although he had good motives, Monty took an easy way out. This may sound pat and trite, but Norton is wonderful portraying this conflicted character. It is in this respect that "25th Hour" most resembles "Mean Streets." Norton reminded me of Harvey Keitel's introspective gangster contemplating the fires of hell. Some may say that it's easy to feel sympathy for Monty because he's such a nice guy. The movie only shows one victim of his crime. Monty is confronted by a pathetic junkie in need of a fix. The movie doesn't go into as much detail about how Monty was able to harden his heart to those he preyed on. Maybe less of the student /teacher sub-plot and more of this issue would have made "25th Hour" a better film. Lee doesn't avoid the subject. There is a wonderful scene between Frank and Naturelle, which deals with it head on. The movie includes a very nice subdued performance by Brian Cox as Monty's dad, James. James blames himself for Monty's troubles. Monty's mom died when Monty was 11 years old, and James turned into a drunk. Brian Cox's wonderful Irish lilt is magical as he does the voice-over Lee's touching and ambiguous ending. Lee is to be lauded for his New York attitude. The credit sequence will touch even the most jaded heart. Lee is able to show the effects of 9-11 on New Yorkers and Americans in general during the course of the movie. 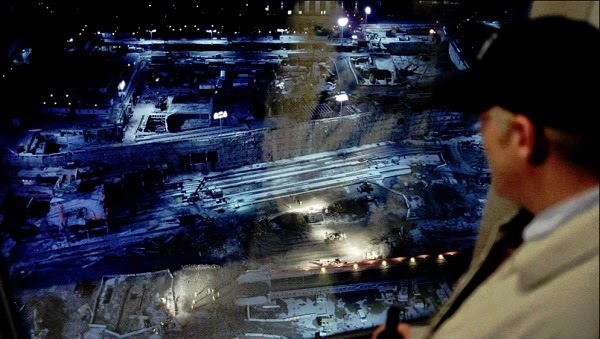 There is a great scene shot from a window over-looking the clean up at ground zero. The scene represents the events of 9-11 as well as choices that Monty will have to make in the future. While "25th Hour" isn't a masterpiece, it is the best film by Spike Lee since "Malcolm X."